Parakeets in Chicago? Yep -try Hyde Park. Unlike other Psittacids, Monk Parakeets nest in large stick masses with separate entrances for several pairs. All other parrots nest in tree cavities. 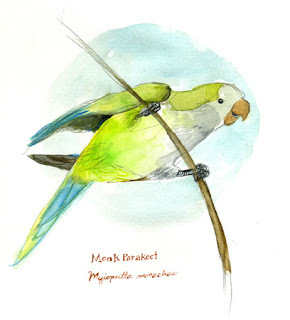 Monks are a sub-tropical species native to Argentina. Feral populations are established in Oregon,Conneticut, Florida, New York and Illinois.